You might think it would be difficult for adrenaline junkies and die-hard fashion followers to find something in common. It would, after all, be easy to assume that lovers of outdoor sports simply don’t care what they’re wearing, or that most fashionistas wouldn’t be seen dead running around a forest. All of these preconceptions and assumptions were, however, shattered when Moncler burst onto the fashion scene after being founded in France in 1952. Pioneering global leaders in luxury technical outerwear, Moncler has built its brand on a fusion of functionality and high fashion. They combine durability and the strength to cope with the most extreme outdoor sports with bold prints, oversize silhouettes and cutting edge design. Not only that, they readily participate in research to improve the performance of their clothing, harnessing the knowledge of extreme sports and mountaineering experts. 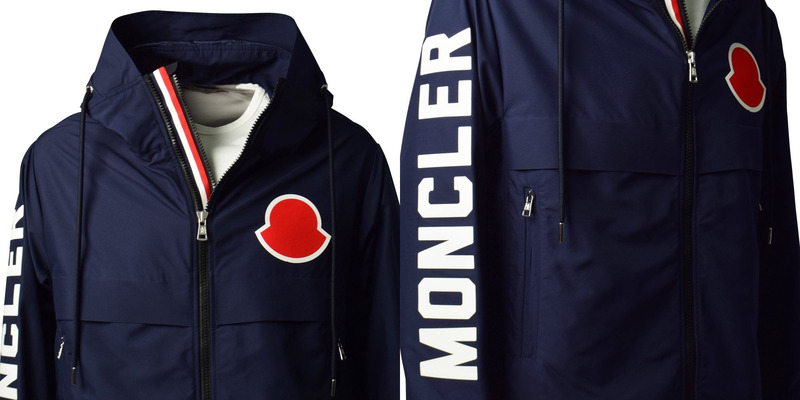 Brand new to Brother2Brother for SS19, Moncler’s offering is perfect for those who love to look good, but who won’t let that stop them from living life to the fullest. We’ve compiled six of our favourite pieces from the brand new collection for your perusal, but don’t forget to head over and check out the whole Moncler SS19 collection once you’re done! Heading to any festivals this summer? Let’s be honest, you’re bound to encounter at least one biblical-level rainstorm! If you want to go prepared, you might want to take a closer look at this anorak, brand new from the Moncler SS19 collection. Super lightweight, this anorak is waterproof and extremely durable and is sure to protect you no matter what the British summer tries to throw at you. With a cool navy blue design featuring the brand’s signature tricolour branding and emblem, this coat will keep you warm, dry and super stylish all summer long! Only Moncler could upgrade swim shorts to make them technologically superior to their rivals. Specially constructed from extra breathable materials, these swim shorts are designed to dry faster, making them more comfortable for all-day wear. They also have a pocket! 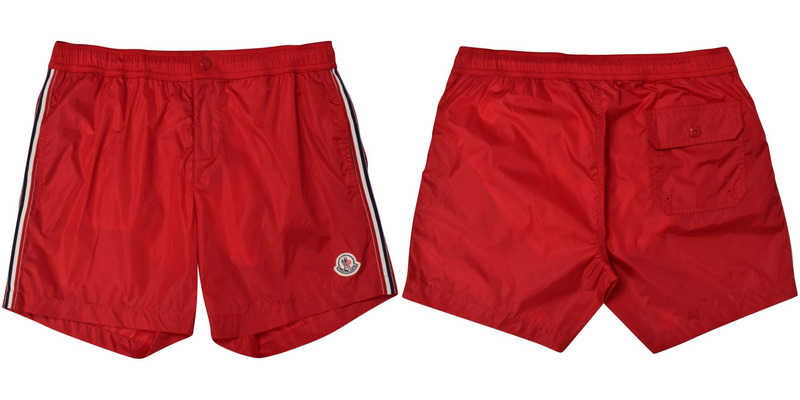 The bold red design and tricolour branding complete the look, so if you love lounging by the pool on a hot summers day, even if you do live in the UK, add these shorts to your collection today! These classic leather low top trainers brand new for summer 2019, are the perfect pair to go with any casual look this season. 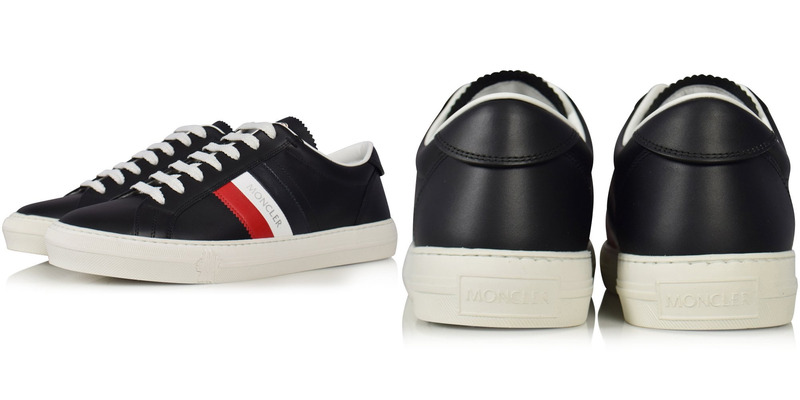 Constructed from soft calfskin leather, these shoes feature a predominantly navy design, with a contrasting white sole and tricolour detailing to the side of the shoe, completed with the Moncler branding. Simple and stylish, comfortable and durable, these shoes should definitely be a serious consideration if you fancy adding to your trainer collection! For any snow sports enthusiasts, you’ll know it’s important to stand out amongst the endless mass of white as best you can, just in case of an accident. So what about this jacket from Moncler? With a bright lemon yellow body, a polyamide shell and a filling of feather down, this coat is designed for extreme visibility and extreme temperatures, perfect for any snow lover out there! 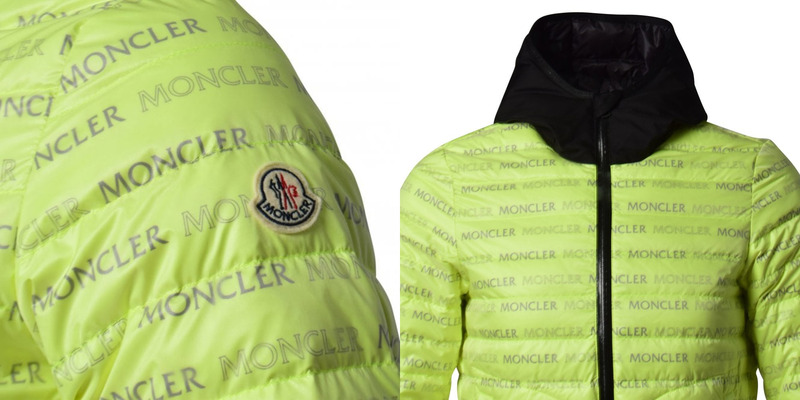 The design is completed with the all over Moncler print, so no matter what happens, you’ll always be seen, and your fashion chops will be well known all over the mountain. Get it before it’s gone! 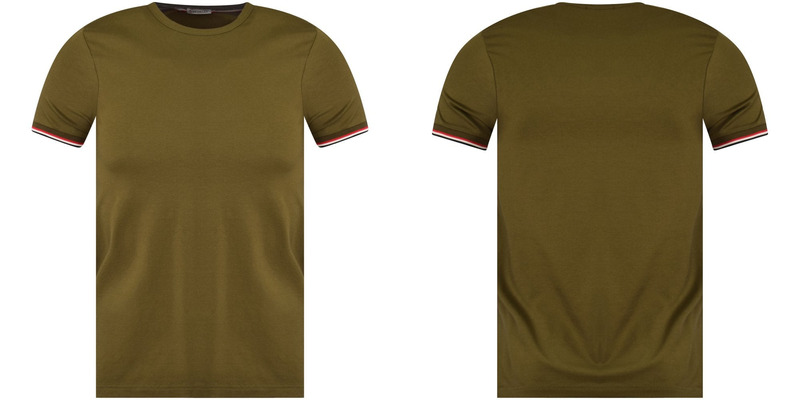 A simple, slim fit t-shirt is a summer staple, and this brand new offering from Moncler will have you looking stylish and on trend all season long. Constructed from lightweight, breathable cotton, the design features an all over khaki green colour, with tricolour detailing to the sleeves. A perfect paired down t-shirt for a casual look, it could also be combined with a blazer and smart shoes for a dressier occasion. You might think you have too many t-shirts already, but one more won’t hurt. right? If you’re less into extreme sports, more into a bit of football in the park on a Sunday, this might be more up your street. This soft, 100% cotton sweatshirt is perfect for casual kickabouts and cosy chilling sessions on the sofa. 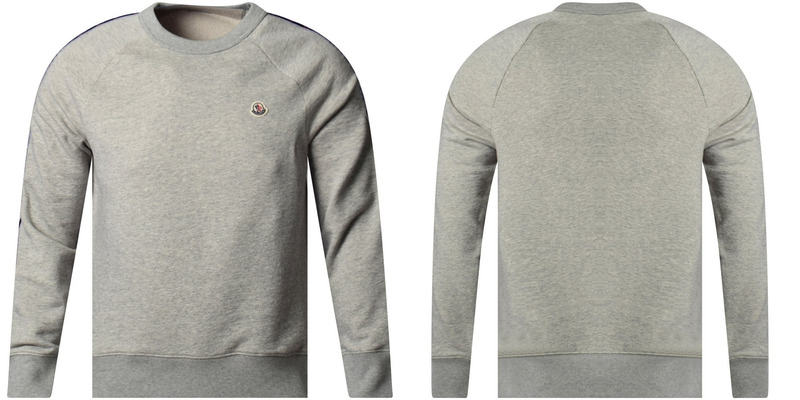 Constructed in grey, the sweatshirt features raglan sleeves, logo taping down the arms and the Moncler brand emblem to the chest. Simple and casual but effortlessly stylish, this is the perfect go-to for those low-stress days. Get your hands on this one quick!